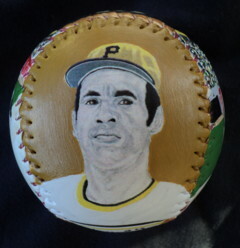 This Legends Hand Painted Pittsburgh Pirates Baseball features four of my original paintings. 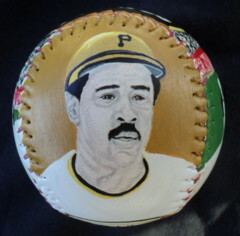 Side two has my painting of Willie Stargell. Click here for a closer look. 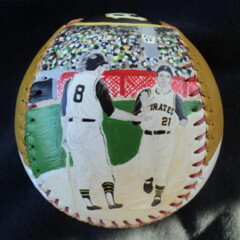 Side three has my painting of Willie Stargell shaking hands with Roberto Clemente after a home run. Click here for a closer look. 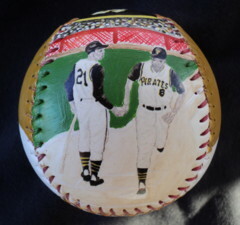 Side four is my painting of Roberto Clemente shaking hands with Willie Stargell after a home run. Click here for a closer look. 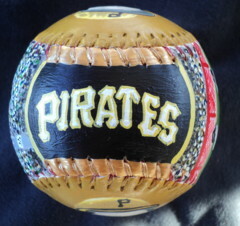 Side five, which is the top of the baseball, has "PIRATES" hand painted in team colors. 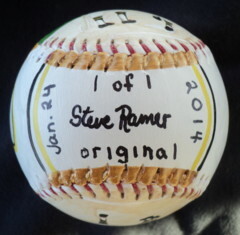 Contact Me To Purchase This Baseball or click on the Pay Pal Add To cart button below to use your credit card or Pay Pal.